The people who drink alcohol in moderation,end up living longer than the people who don’t drink alcohol at all. 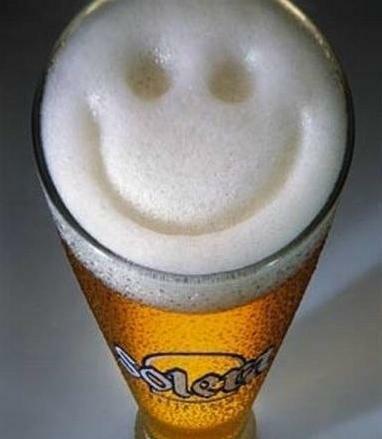 In recent years, however, research has suggested that moderate drinking may also be salubrious! Can this be true? Or could the widely publicized benefits of a daily glass of wine or a can of beer be largely the product of hype? Is it possible that the advice to drink in moderation — for your health — is all a mistake?. It all started some 18 years ago with the description of the French Paradox .1, 2 Why, some scientists wondered, did the French have so few heart attacks when they were not exactly committed to enthusiastic exercise and they ate a diet high in both cholesterol and fat?. The scientists reasoned that this had to do with the type of fat (monounsaturated olive oil) that the French ate, and the fact that they drank alcohol daily, often in the form of red wine. Many articles followed, all agreeing that moderate wine drinking was healthful as well as enjoyable. One particularly convincing study — known as the J-curve study — described the likelihood of death from heart attacks and strokes .3, 4 The J came from the appearance of a graph showing the chances of dying each year compared to daily alcohol intake. What the scientists discovered was that both heavy drinkers and those who drank no alcohol at all had a higher death rate than those who drank alcohol in moderation. Moderate drinkers had the lowest death rate of all the groups. 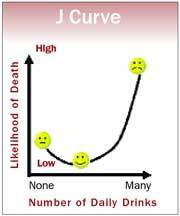 The result of this study was a graph shaped like a big letter J — so it became known as the J curve of mortality. The evidence did seem convincing. And all subsequent studies have shown the same thing. Those who drink moderately live longer than those who dont drink at all. This was unexpected and, until recently (18 years later), had not been satisfactorily explained. In 2004 a group of scientists went looking for confounders in the studies on alcohol and longevity — and they found them, lots of them. The study findings were published early this year under the intimidating title of Cardiovascular Risk Factors and Confounders Among Nondrinking and Moderate-Drinking U.S. Adults. 10 In this report, Timothy S. Naimi and his collaborators (11 coauthors) analyzed whether nondrinking and moderate-drinking populations are comparable. The answer is — they are not! The moderate drinkers are much less likely to suffer from common diseases. The moderate drinkers are much more likely to be well educated, earn more money, etc. 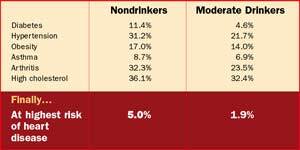 In fact, the moderate drinkers did significantly better on 27 out of 30 factors looked at. All this information was incured from the 2003 Behavioral Risk Factor Surveillance System, which surveyed 250,496 individuals. The Centers for Disease Control (CDC) in Atlanta, Georgia, funded and supervised the data collection for purposes other than the effects of alcohol on health. They were looking for developing diseases or health threats in the population. After excluding the sick and the heavy drinkers (more than two drinks a day for men, one a day for women) from the analysis, 116,841 nondrinkers and 118,889 moderate drinkers remained.